FULL SIZE patterns for all six projects shown. 8"H. Projects call for our #4003 Thermometers that are mounted on a white weather resistant styrene back and are accurate to plus or minus 2 degrees. 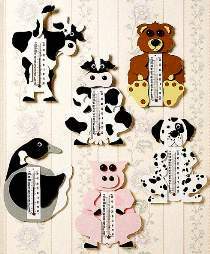 Thermometers measure 1-1/4" x 4-3/4". Order thermometers separately.